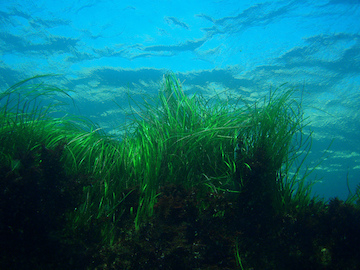 Seagrass beds are complex ecosystems that support fish and other marine life. Perhaps it’s not surprising, then, that an effort to restore some seagrass beds worked best when several species of seagrass were planted together. Seagrass is important for both marine life and human life. It provides habitat and hiding places for fish and many other marine organisms. That maintains a ready supply of those organisms for human consumption. Seagrass also helps protect the coastline from tropical storm damage, and stores carbon that otherwise would be in the air, making Earth even warmer. Coastal development, climate change, and other problems have damaged many seagrass beds in the Coral Triangle, a vast region of the southwestern Pacific Ocean. So far, no one has tried to restore them, or even to limit the damage. But researchers from the University of California-Davis conducted some tests in damaged beds around Indonesia. They planted six different native species of seagrass in different plots. Some of the plots got just one species, while others got two, four, or even five. After a year, the researchers found that the plots with more species of seagrass were doing better than those with just one. No one is sure why that’s the case. It could be that different species are better at stabilizing the sediments, trapping nutrients, blocking sunlight, or performing other tasks. So putting them together helps build stronger beds -- complex ocean ecosystems where there’s strength in numbers. You can receive Science and the SeaTM content right on your desktop or MP3 player. Subscribe to our RSS Feed and Podcast.